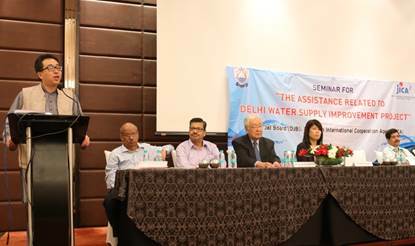 The seminar under the technical cooperation project of Japan International Cooperation Agency (JICA), named “The Assistance Related to Delhi Water Supply Improvement Project” was organized by Delhi Jal Board (DJB) and JICA. 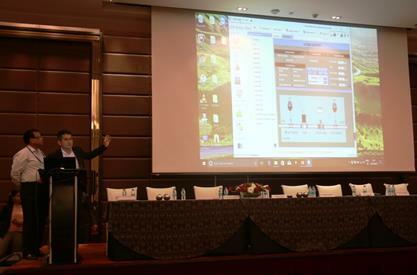 The objectives of the seminar were to share the experiences and knowledge of water supply managementand toinaugurate the Supervisory Control and Data Acquisition (SCADA) systems in Pitampura Pilot Project area. Esteemed guests included Ms. Nidhi Srivastava, Additional CEO, DJB; Mr. S.N.A Najmi, Member Finance, DJB;Mr. R. S Tyagi, Member (W.S), DJB; Mr. Yoichi Yamamoto, Tokyo Metropolitan Government (Tokyo Waterworks)and Mr. Takema Sakamoto,Chief Representative, JICA India Office, among others. The National Capital Territory of Delhi has a high rate of Non-Revenue Water (NRW*)between 40 to 50% and the reduction of NRW was one of the major issues to be tackled for efficient usage of drinking water. Subsequent to the preparation of master plan for water supply for Delhi 2021, JICA has committed Official Development Assistance (ODA) loan of JPY 28,975 million (approx. Rs. 1,700 crore) for“Delhi Water Supply Improvement Project” to rehabilitate and improve the facilities under Chandrawal Water Treatment Plant area. JICA has been conducting the technical cooperation project for 4 yearsin order to improve the skills and management capacities of DJB officials and to implement the Pilot Project.The seminar focused on the achievements of the Pilot Project, whose main objective is to monitor and control water flow and pressure at selected District Metered Areas (DMAs) for equitable water distribution by using SCADA system. It is the first SCADA system in the country to monitor and control the water distribution with water-controlled valves at 13 local control points, which would enable DJB to initiate equitable distribution and NRW management in Delhi. JICA has extended the support not only on the installation of SCADA system, but also on the provision of the Japanese expertise on operation method and management of equitable distribution using SCADA. Officials from Tokyo Metropolitan Government, whose NRW ratio is prominently low, were also invited as JICA Experts for presentations. Since 1991-92, JICA has committed 677 billion Japanese Yen(approx. Rs. 40,000 crore) for the development of water supply and sanitation facilities for improved living environment and economic development in India. *Non-revenue water is the water, which is lost during distribution by leaking or not being charged. Established, by a specific law, as an independent administrative institution under the Government of Japan, Japan International Cooperation Agency (JICA) aims to contribute to the promotion of international cooperation, as a sole Japanese governmental agency in charge of ODA implementation. JICA is the world’s largest bilateral donor agency. JICA works as a bridge between Japan and emerging countries, and provides assistance in forms of loan, grant and technical cooperation so that the emerging countries can strengthen their capabilities.